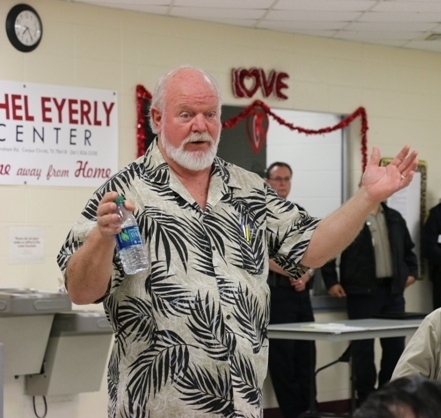 James Skrobarczyk and Dan Hogan hosted a follow-up town hall meeting for Flour Bluff residents on February 10, 2016, at the Ethel Eyerly Community Center. 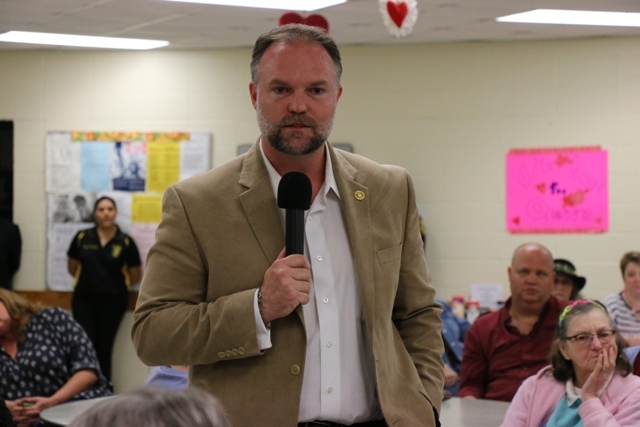 Residents had the opportunity to speak with District 4 Councilwoman Colleen McIntyre, Chad Magill Council Member At-Large, and Chief of Police Mike Markle about homelessness, PlanCC 2035, and criminal activity in the Flour Bluff area. The meeting started with a brief explanation of what services are available through the community center but quickly turned to the recent events in the Turtle Cove subdivision. 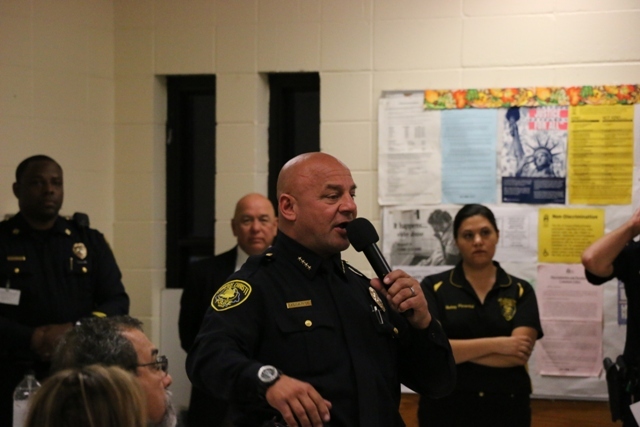 Some residents of that area expressed their concerns about what they perceived as retaliation from CCPD and Code Enforcement for requesting help with the criminal activity in and around their neighborhood. Some of the residents received notices about fences that are too high, house numbers that are too small, and other violations of city property ordinances. “Why did we need this show of force?” asked one resident at the meeting. Blackmon said, “It’s not going to a citation. It’s not getting filed in court. The ones that are quality of life issues – high grass or junk vehicles – we will be getting back to you. Don’t worry about the dates. And, I saw on the blogs about how ridiculous it is that house numbers have to be a certain size. I’ll be honest with you. When we re-wrote the property maintenance code last year, I actually put that in the new one. Let me tell you why. Being a police officer for 27 years, it’s very frustrating to look for an address when somebody calls 911. Somebody needs help, and it takes extra time to find that address. Oftentimes, we get out there, and we’re looking at the neighbors’ addresses to figure out where we need to be. Seconds are lives, and that is important. Again, these are not citations. We are just trying to educate you. Many of you didn’t know this rule.” According to Blackmon the correct size is 4 inches or larger. “It’s not an apology. I’m trying to explain what happened and what our intent was. We are on board with you folks. Where we could have done better is notifying you before we went out there. The mission was to improve the aesthetics of your neighborhood,” replied Blackmon. 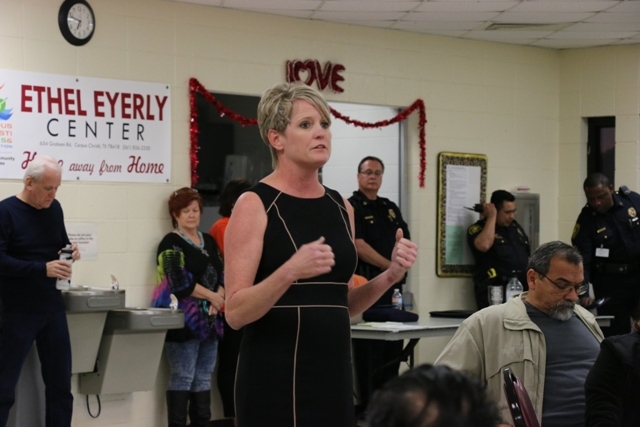 Later in the meeting, other Flour Bluff residents spoke about criminal activity in their neighborhoods. Some shared how they use Nextdoor.com and Neighborhood Watch to help combat problems themselves. Chief Markle said that a lot can be learned from Turtle Cove, that what they’re doing “should be the baseline” for what other neighborhoods can do. “When we do assessments in neighborhoods, like the one we did in Turtle Cove, you wouldn’t believe how many garage doors we see open in the middle of the night or boats loaded with fishing gear at 4:00 in the morning. You really have to go the extra mile to protect yourselves. I hate to say that, but you do. Take your valuables out of your cars and lock your doors. Most burglars are opportunists. If they see something, they’re going to take it. There’s something called CPTED (Crime Prevention through Environmental Design). You cut down shrubs around your house that provide good hiding places, have lighting in front and around your house so that people aren’t invisible at night. Those are the kinds of things you need to do. We provide crime prevention specialists to help you learn about ways to protect yourselves. We’re happy to do that. Just pick up the phone and call us. We will come back in a couple of months and do a follow up meeting to let you know what we’ve been doing. 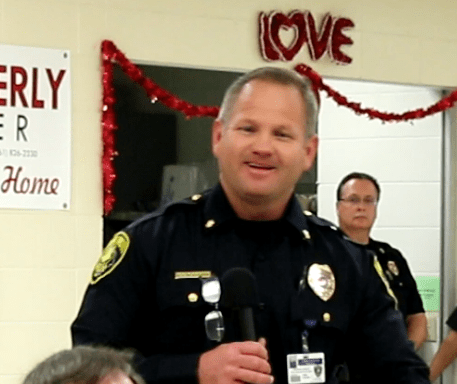 If you keep reaching out to us so that we can respond to your needs, perhaps we won’t have any more angst over some of the things we do as a police department.” Chief Markle apologized for the lack of communication. “The goal is to meet the needs of the homeless while preserving quality of life for the rest of us,” said McIntyre. Councilman Chad Magill opened his talk with a few words recognizing McIntyre’s efforts in working on the homeless initiative. He then explained the make-up of the city council and the role of the at-large council members. “What I believe – and this is my own philosophy – is that an at-large council member does everything possible to make sure each district council member succeeds in their district,” Magill said. Magill then launched into his talk on PlanCC 2035. “Every 30 years or so, we come up with what we call a comprehensive plan. What I want to give you is a common sense approach to what we as a city want to be when we grow up in the next twenty years,” said Magill. “Our city charter really determines who we are and what we do. In that charter, we have a section on comprehensive planning; it’s Article 5, Section 4. When we adopt a comprehensive plan, it becomes the rule of law, meaning it also affects and determines area development plans, including the Flour Bluff Development Plan – which, by the way, needs to be updated. It was adopted September 4, 1993. A comprehensive plan drives a message across the city, our region, and even our extraterritorial jurisdiction in how we grow, which follows the path downward toward area development plans.” Magill asked the audience to picture a pyramid with the comprehensive plan at the top and all other area plans falling below it. Magill briefly described the 1955 and 1987 plans by giving examples in each. He said that the 1955 plan included a provision that addressed proper compaction of streets over utility cuts to prevent street deterioration. The 1987 plan called for the creation of bike lanes, support for the Port of Corpus Christi, help for growth of our military presence, and support for our public safety (i.e. fire, police, EMS, hurricane response). Magill said that these plans are what he refers to as “bricks and mortar” plans, which are engineering-driven and based on real-world scenarios. Magill said that contrary to what some people are saying, he did not re-write PlanCC 2035. 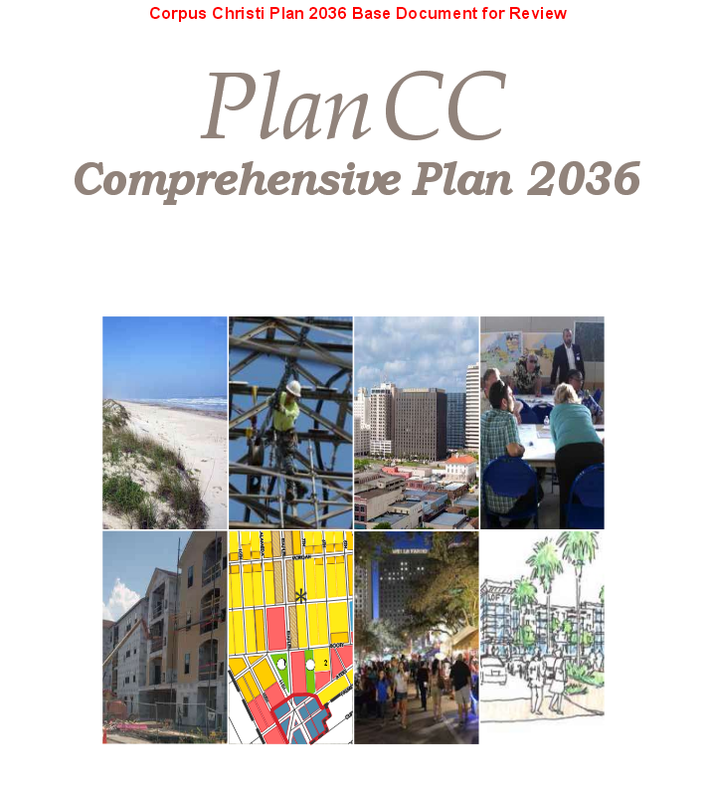 “The reality is I wanted to give clear direction to the planning commission and give them something to work from.” He said that PlanCC 2036 brings together what he deems is good about the current plan and PlanCC 2035. When Jeff Rank, local attorney and contributor to PlanCC 2035 raised concerns about the time and money spent on the plan being wasted if the plan is thrown out, Magill said that he voted to start the process, but he couldn’t vote for the final plan as it was proposed. Magill encouraged audience members to go to his website, chadmagill.com, and read the plans, including 2036, so that they could learn what his thought processes were in submitting the plan. All other comprehensive plans can be viewed there, as well. Other questions and comments from the audience revolved around traffic issues, the harbor bridge, city debt, zero-based budgeting, EPA fines, and utility bills. ← Lynn Kaylor Has Left the Building!